CuCo Creative continues to expand its digital portfolio with international leisure group Merlin Entertainments – both underwater and underground. 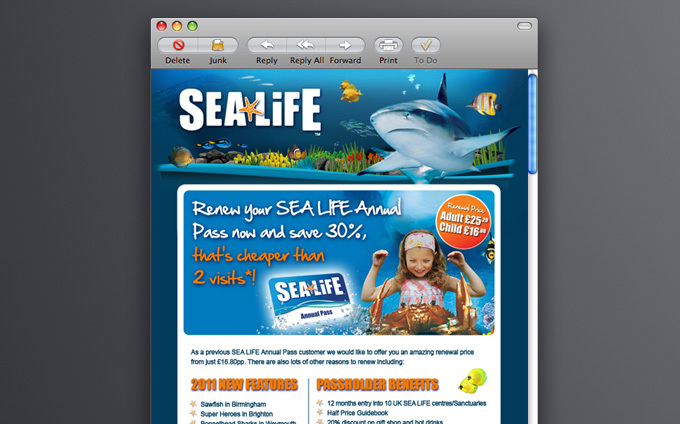 In addition to producing the latest HTML Newsletters for Merlin’s Sea Life Centres and the National Seal Sanctuary in Cornwall, we are also working on a similar project for the company’s grisly, gruesome – and highly popular – historical attraction, The Dungeons. The fully customisable HTML Newsletters enable each centre’s marketing team to highlight specific promotions or events, ensuring maximum web impact and relevance. For example, The Dungeons have a UK presence in London, York and Edinburgh, as well as similarly themed attractions in Hamburg and Amsterdam. Social networking links are built into all the newsletters.